El botellón (The jug); Una Mañanita (One morning); Mi gallo corococó (My rooster crows); Dolores; ¿Lo que suena, qué será? (That sound, what could it be? ); La maravilla (The marvel); Oí, ve (Listen, look); Lo que me trajo el Niño Dios (What the Christ Child brought me); ¿A cómo vende la piangua? (How much is the piangua? ); Pango; Vamos a adorar a Antonio (Let's worship Saint Anthony); Salomé. While the marimba reminds us of the rich culture bequeathed by African slaves to Latin American artistic traditions, it is only in the Pacific coast of southern Colombia and northern Ecuador where it has kept close connections to a traditional 'African' culture. On the disc ¡Arriba Suena Marimba! the female singers of Grupo Naidy, accompanied by marimba and drums, represent the preservation and perseverance of the culture and tradition of a fugitive community (palenques) who escaped slavery in the nineteenth century and mined for gold hidden in the rich water network that forms the Pacific river basin. As the community travel from river to river, gathering herbs for medicine, fishing, and panning for gold, they recite poems, jokes and stories and hold currulaos: musical gatherings in which the river-people congregate at the local marimba house to sing and dance. This disc, recorded in the city of Cali, captures the virtuosity of the marimberos. Usually, two marimberos play simultaneously, one playing an ostinato-like pattern in the lower register while the other provides melodies and improvisations in the upper register. The liner notes explain that 'local folklore recounts the legendary musical battles of the marimberos against the devil, who challenges them to virtuosic musical duels in which prize is their very soul.' The marimbas are accompanied by bombos (bass drum), cununos (wooden drums) and guasa (bamboo tube filled with seeds used to keep time while the singers sing). 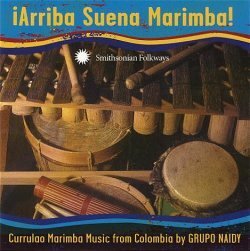 In addition to the currulao, this disc also has tracks in other polyrhythmic genres such as juga, bunde, alabao, and canto de boga. The female choir is distinctive in both timbre and harmony. Their gravely voices contrast with the rich harmonies which, in turn, are sung in counterpoint to the lilting, often calypso-like rhythms of the percussion ensemble. The songs themselves have a call and response structure which evokes the sound of community. Often they are poignant lullabies: the opening track El botellón is performed at a child's funeral accompanying their direct ascent into heaven. At other times they reflect women's influence and power in the community. Track 2, Una mañanita, references the thorny rose as a metaphor for a woman's protective power: 'Don't step on this rose … if you do, she'll prick your feet'. Other songs evoke Catholic imagery. Track 8 is a juga, which is normally held on a saint's feast day, for el Niño Dios (the Christ Child) sung for Three Kings Day in the street processions; track 11 is in adoration for the popular San Antonio sung to thank him for prosperity and good fortune. Other songs describe everyday stories involving all members of the community and clearly illustrate the central role that music plays in providing this community with an enduring and evolving sense of itself. The CD is accompanied by adequate notes by Michel Birenbaum Quintero which outline a little of the musical contexts and are followed by short biographies of each musician. There are many anecdotal passages and mentions of accolades the musicians and the group have received. However, as I reached the end of reading the notes I was struck by sadness as I read that two of the musicians were shot and killed on a street corner in Buenaventura after a rehearsal.